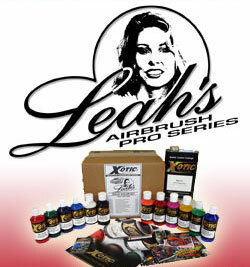 05-100-04 Ebonee Black Airbrush Base 4 oz. 05-900-04 Mightee White Airbrush Base 4 oz. 05-735-04 Bloody Red Airbrush Base 4 oz. 05-620-04 Chinese Yellow Airbrush Base 4 oz. 05-211-04 Blue Airbrush Base 4 oz. 05-418-04 Key Lime Green Airbrush Base 4 oz. 05-555-04 Bright Orange Airbrush Base 4 oz. 08-100-04 Sparklee Silver Airbrush Base 4 oz. 08-601-04 Shiny Gold Airbrush Base 4 oz. 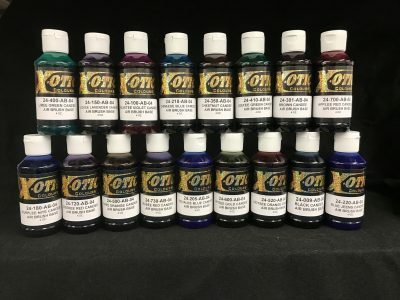 14-210-04 Ocean Teel Airbrush Base 4 oz. 77-150-04 Steel Mist Airbrush Base 4 oz. 79-250-04 Purple Pearl Airbrush Base 4 oz. 79-540-04 Orange Pearl Airbrush Base 4 oz. 79-615-04 Screaming Yellow Airbrush Base 4 oz. 79-750-04 Hot Pink Pearl Airbrush Base 4 oz.